Corrie Beckett had a strange feeling when her son started getting separation anxiety as she left for work. 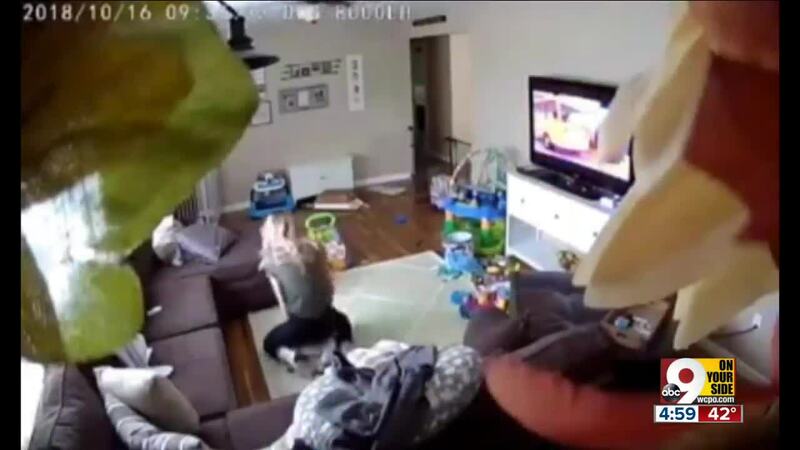 So she got a nanny camera, and she said what she saw confirmed her fears: her 10-month-old son crying on the ground, with the babysitter sitting on the infant and telling him to "shut up." The babysitter's actions are now under review by Butler County prosecutors. Beckett said she felt "anger, sadness, guilt" upon seeing the video of her son, Owen, with the babysitter she'd hired about two months earlier and had known for a few years. "As mad as I was at what she was doing, I was also mad at myself for handing my son to her and had no idea of what was going on," she said. MIDDLETOWN, Ohio — Corrie Beckett had a strange feeling when her son started getting separation anxiety as she left for work, so she got a nanny camera. What she saw confirmed her fears: Her 10-month-old son crying on the ground, with the babysitter sitting on the infant and telling him to "shut up." The babysitter's actions are now under review by Butler County prosecutors. Beckett said she felt "anger, sadness, guilt" upon seeing the video of her son, Owen, with the babysitter she'd hired about two months earlier and had known for a few years. Board-certified pediatrician Dr. Kenton Pate said the babysitter didn't take any of the correct actions to calm down a crying baby. "It seems like she was losing some of her composure," Pate said. "You wouldn't typically sit on top of a child. I think that's inappropriate." Beckett agreed. That's why she took the video to the Middletown Police Department, which had closed the case but has since reopened it and is now getting assistance from prosecutors. "That's been a difficult case because, although it's very emotion-evoking, is it a crime or not? Clearly, if that's your child, you don't want that person watching your baby anymore," police Maj. Scott Reeve said. Reeve said the babysitter, whom WCPO will not name because she has not been charged in relation to the incident, does have a criminal background. He declined to provide more details because of the ongoing investigation. "The difference between being rude and inappropriate with a child and it being criminal is a fine line," he said. Reeve said it's a good idea for parents to do research before hiring a babysitter. Middletown Municipal Court records are available online. "Don't trust somebody just because you know them," Beckett said. "People are fake and are good at hiding their true selves."